Did the Decline in Social Connections Depress Americans’ Happiness? During the last 30 years US citizens experienced, on average, a decline in reported happiness, social connections, and confidence in institutions. We show that a remarkable portion of the decrease in happiness is predicted by the decline in social connections and confidence in institutions. We carry out our investigation in three steps. First, we run a happiness regression that includes various indicators of social connections and confidence in institutions, alongside with own income, reference income, and the usual socio-demographic controls. 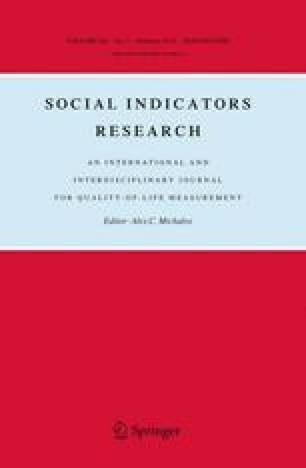 We find that indicators of social connections and confidence in institutions are positively and significantly correlated with happiness. Second, we investigate the evolution of social connections and confidence in institutions over time, finding that they generally show a declining trend. Third, we calculate the variation in happiness over time as predicted by each of its statistically significant correlates, finding that the decrease in happiness is mainly predicted by the decline in social connections and by the growth in reference income. More precisely, the sum of the negative changes in happiness predicted by the reduction in social connections and the increase in reference income more than offsets the positive change predicted by the growth of household income. Also, the reduction in happiness predicted by the decline in confidence in institutions is non-negligible, although substantially smaller than the one predicted by either social connections or reference income. The online version of this article (doi: 10.1007/s11205-011-9971-x) contains supplementary material, which is available to authorized users. We would like to thank Andrea Battinelli, Marina Bianchi, Leonardo Boncinelli, Paola Bordandini, Roberto Cartocci, Sergio Currarini, Andrew Clark, Massimo D’Antoni, Sergio Destefanis, Massimo De Vito, Francesco Drago, Daniela Federici, Francesco Ferrante, Kyosuke Kurita, Mario Lavezzi, Malgorzata Micucka, Joel Mokyr, Tushar Kanti Nandi, Ugo Pagano, Vittorio Pelligra, Fabio Petri, Robert Putnam, Ernesto Savaglio, Betsey Stevenson, Mauro Sylos Labini, Silvia Tiezzi, and Giulio Zanella for their valuable comments. We especially thank Samuel Bowles, John Helliwell, and the anonymous referees of this journal for their important suggestions on how to improve our results. All mistakes remain ours. We acknowledge the PRIN 2004–2007 research group on “Economics, happiness and inter-personal relationships” for financial support to this research. Clark, A., & Oswald A. (2002), Well-being in panels. mimeo, http://www.pse.ens.fr/clark/revClarkOsdec2002.pdf. Stiglitz, S., Sen, A., & Fitoussi, J. P. (2009). Report by the commission on the measurement of economic performance and social progress. http://www.stiglitz-sen-fitoussi.fr/documents/rapport_anglais.pdf.